Item # 307534 Stash Points: 2,995 (?) This is the number of points you get in The Zumiez Stash for purchasing this item. Stash points are redeemable for exclusive rewards only available to Zumiez Stash members. To redeem your points check out the rewards catalog on thestash.zumiez.com. Complete your athletic vibes this summer in the 3 Stripe Purple Glow Crop Tank Top from adidas. This sleeveless, slim fitting top features a cropped silhouette and a crew neckline for a design that will look just as good at the gym as it does in the streets. 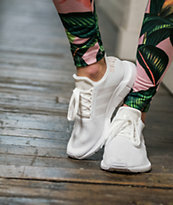 An embroidered Trefoil logo is located at the center chest, while the outseams display adidas' signature three stripes sewn along the outseams, creating a sporty look that will pair well with all of your casual looks. 3 Stripe Purple Glow Crop Tank Top from adidas. Embroidered Trefoil logo at the chest. adidas 3 stripes sewn along outseams. 15.5" (40cm) from top shoulder seam to bottom hem..